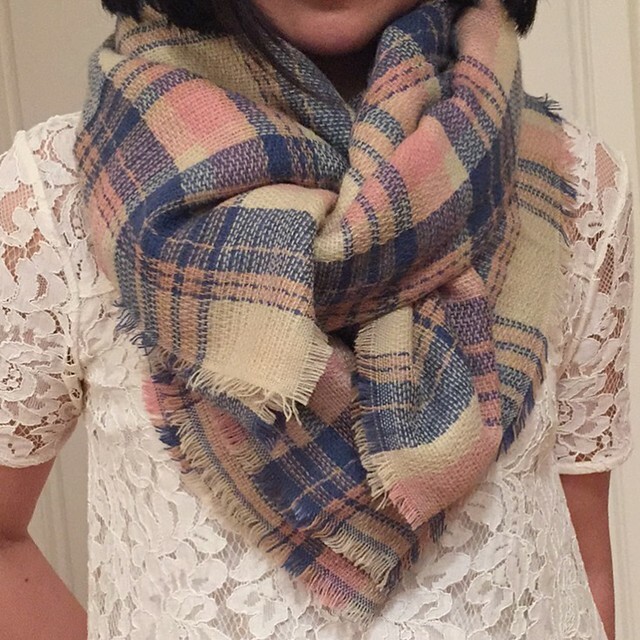 I received this pretty plaid oblong scarf today and I love the colors but I’m not sure how many of my outfits it would match with. I prefer more neutral color palettes like this check scarf or this black and white plaid scarf. I also like the burgundy in this plaid scarf but it’s another large, rectangular scarf. 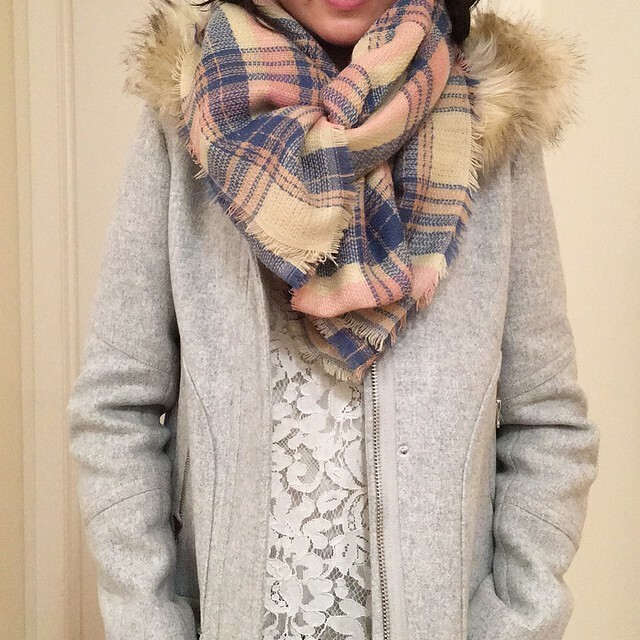 I tried on this scarf on with my J.Crew Chateau Parka (review here) after figuring out how to tie it by studying this Pinterest tutorial. Note that I folded it into thirds to achieve this exact look above and below. 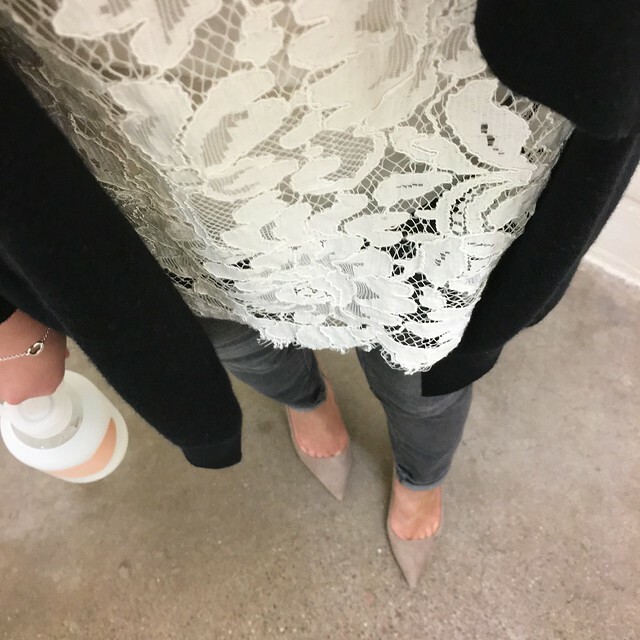 I wore this pretty lace tee (review here) for work today and I really love how it looked with the grey skinny jeans. I wasn’t sure I’d reach for them much since I gravitate towards blue jeans but I’ve been able to pair it with two other tops here and here. My husband loves his grey jeans so I’m sure I can borrow some ideas from him too. Update 10/15 – The LOFT flash sale is over but you can now get 40% off tops and sweaters. Also get an extra 40% off all sale styles. Valid in stores and online. Since no code is needed you can use the stackable code INSIDER235 online for an additional 25% off full-price purchases of $100+ (excludes Lou & Grey items). That’s a total of 55% off select full-price styles after online discounts! LOFT is having another flash sale tonight. Get $50 off your purchase of $100+. LoveLOFT cardmembers get $60 off your purchase of $100+. Use code FLASH. Applicable on full-price styles and online only. Sale ends tomorrow 10/15 at 10AM ET. Also get an additional 40% off sale styles. My previous order shipped in two parts so I can’t wait to get all my new goodies.